My friend Carrie has a new book coming out in March – The Juliet Stories. I love Carrie’s writing – her blog is one of my favourites, and her first book, Hair Hat, was excellent – she has a great ability to create a mood that stays with you for awhile after you put the book down (or walk away from the computer after reading one of her blog posts). She currently has a contest on her blog – enter a comment after this blog post for a chance to win the latest copy of The New Quarterly, in which there is a chapter from The Juliet Stories, and a signed copy of Hair Hat – you have until Friday the 27th to enter. I unexpectedly have a free afternoon, and I’m sitting here, in my quiet, clean house. I just had lunch, and will probably take a nap later. It’s a good life! We’re having a ridiculous winter so far. Second warmest December on record, and January hasn’t been much colder. Not enough snow to really do anything fun in – the kids are annoyed. And the walk to school in the pouring rain probably didn’t help. We’ve only had to shovel three times so far. It’s almost time to start planning the garden and it feels like we haven’t even hit winter yet! It’s also been weird because I’ve been a single-project-knitter since last November. That’s not like me at all. I usually have a bunch of things on the go because I’m fickle, and different things lend themselves to different situations. I like a sock for my purse for unexpected waiting times when I’m out and about. Something larger for evenings at home. Something lacy. The occasional hat or mitten. But it’s been nothing but socks since November. Remind me that if I’m going to make a ridiculous pronouncement like “I’m knitting everybody socks for Christmas” ever again, that I shouldn’t wait until November to really get going. Yeesh. Anyway, I finally got the socks sent out on Saturday (yes, Astute Reader, that means I missed the 12th day of Christmas by a long time. In my defense, I had them all finished by January 7th – I just didn’t send them off until last weekend. Which isn’t much of a defense, now that I think about it) I’m knitting socks now (late Christmas/birthday present for someone I’m not related to). And after those are done, I have plans! Oh, yes! A sweater! A bunch of these! Some hats and mittens! No socks! 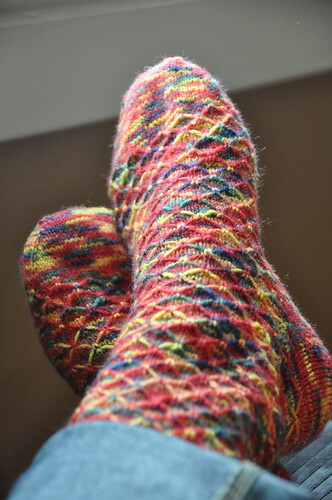 Pattern: Angee, by Cookie A from Sock Innovation. Yarn: Shoppel-Wolle Zauberball. These were for my mom. 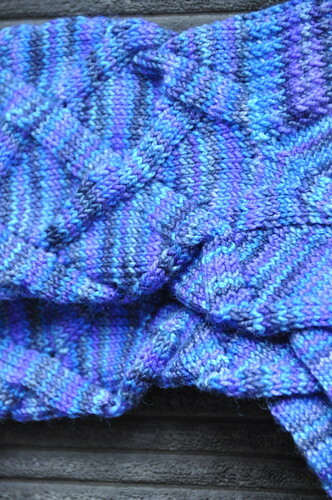 Excellent pattern, beautiful yarn. 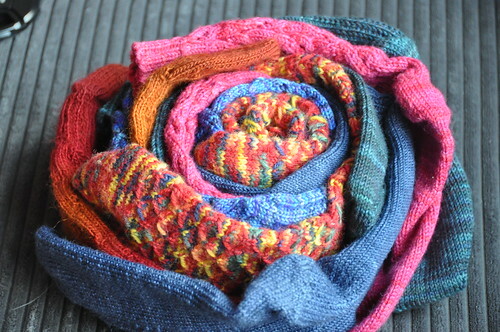 I actually finished these last fall, but didn’t finish tucking in the ends until about a month ago. 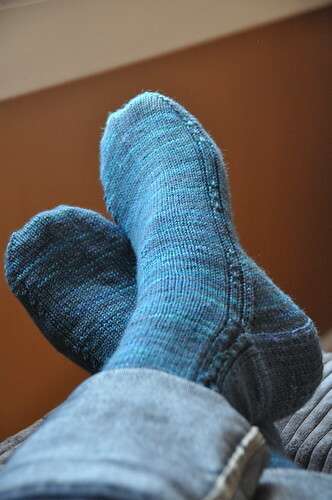 Pattern: Leyburn socks, by Erin over at pepperknit.com. 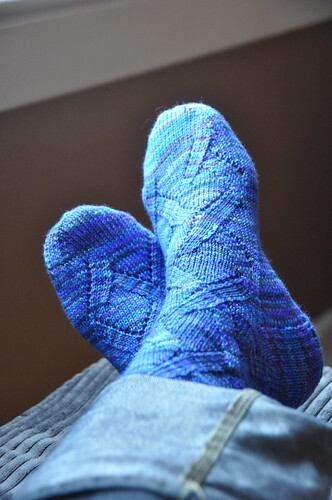 Yarn: Patons Kroy Socks 4-Ply. Those were for my stepdad. 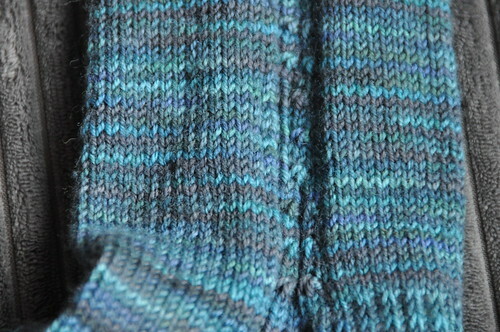 He picked the colour – he wanted the socks to match a sweater his mom had made him years ago. This colourway somehow manages to defy camera focus. No matter what I did. Magic! The pattern was fine – I was just a doofus and kept second guessing the pattern, and making dumb mistakes, and not taking notes (actually, I never take notes. I always think I’ll remember what I did, which would be fine if I ever did, and didn’t have to count the rows and stitches on the first sock to make sure the second matches.) They turned out a bit big (my stepdad has feet about the same size as mine! ), but not so bad, I don’t think. 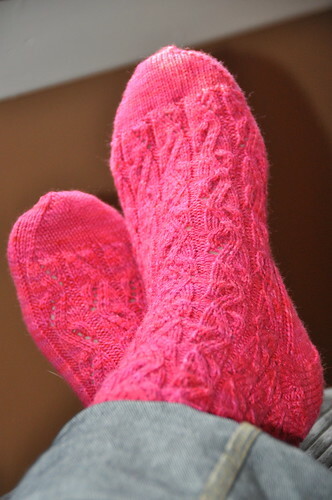 After reknitting each sock twice, I just couldn’t face up to doing it again, so I hope these work. 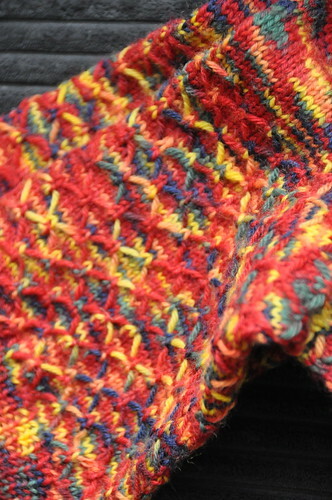 Pattern: Wanida, by Cookie A., idem Yarn: Koigu PPPM. For my sister-in-law. Another genius pattern by Cookie A. Second time making these, and still a pleasure. 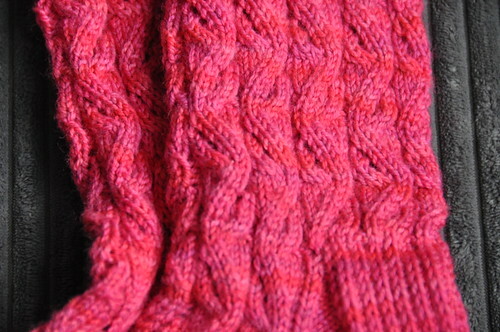 And I love this yarn, so, overall, a win. Pattern: Earl Grey, by Stephanie at yarnharlot.ca Yarn: Koigu PPPM. For my dad. Nice pattern – simple enough to work up quickly, but with a little cable to keep your brain from turning to goo. 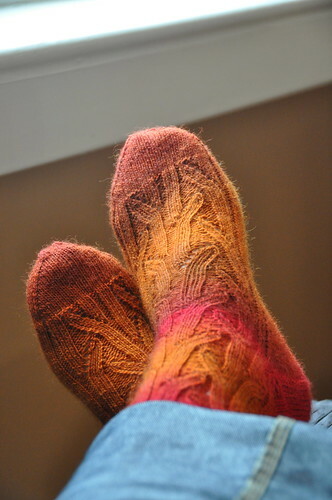 Pattern: Sunshine, by Cookie A., idem (am I using that right?) Yarn: Koigu PPPM. For my stepmom. Pattern was brilliant. 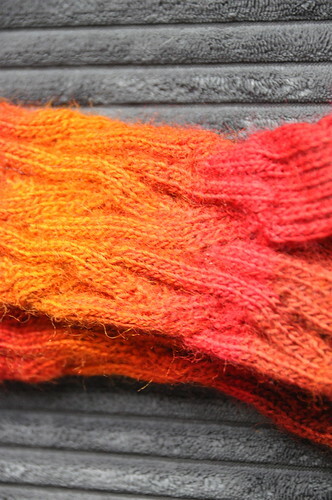 The colour of this yarn (somewhere between what you see in the two pictures) made me very happy. And made Zebula a little covetous. 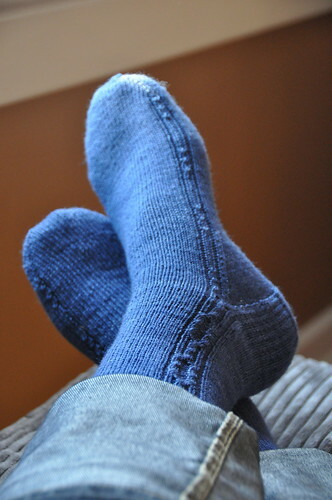 These win the prize for having been knitted the fastest – six days. Pattern: Earl Grey, as above. 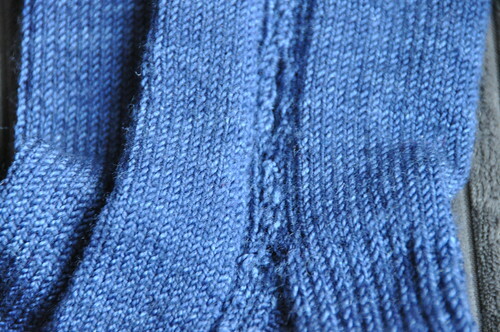 Yarn: Tanis Fiber Arts Blue Label. These got restarted a couple times – I couldn’t figure out which pattern to make, and settled on Earl Grey again, both because they’re nice and they work up fast.